Apex Mass Flow Controllers, Mass Flow Meters, and Pressure Controllers for vacuum and non-vacuum applications combine pinpoint accuracy with flexibility. 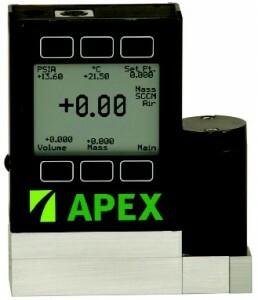 All Apex Meters and Controllers have the flexibility to measure and control over 130 on-board gases, to choose your digital and analog input / output communication preferences, and a vast process connection selection. The ability to control up to 26 Apex devices through one RS232 or USB port, provides your set-up the ultimate in flexibility. Apex Mass Flow Controllers and Mass Flow Meters are in use all over the world in both Research, Analytical, and Industrial Applications. Both OEM equipment builders and some of the worlds finest researchers have already taken advantage of the technological benefits and low prices of Apex Vacuum Mass Flow Controllers, Meters, and Pressure Controllers, now it's your turn! Apex systems are powered by 7-30VDC Power Supply or our PVPS24U wall mount that use universal adaptor for worldwide use. Expensive display or power supple boxes are not needed. Multiple Apex Devices can be linked together with the BB9 Communications Box. 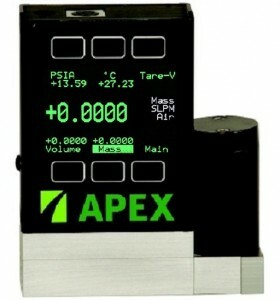 This box uses addressable RS-232 to communicate with all Apex units connected. The BB9 connects directly to a computer via USB port. FlowVisionSC software allows set point control, select gases, and collects and graphs data. LabView Drivers are available for download. Gas mixing software is also available.